Finally we decided to do a series of ISO tests, which would really put the contestants on equal footing. Fixing the ISO setting meant that cameraphones can't cheat by using lower sensitivity and dropping the shutter speed too much. 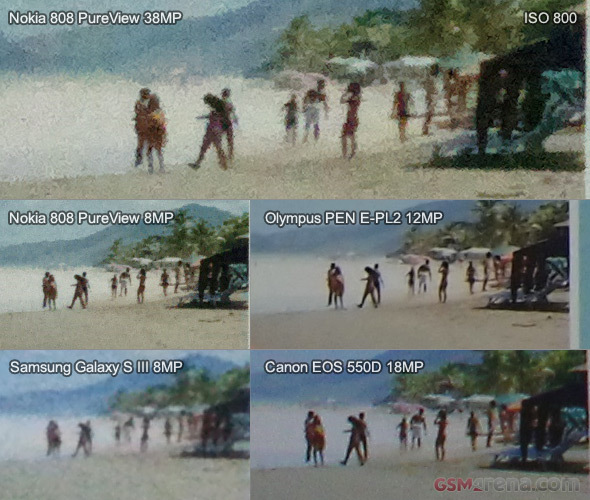 Here's how the sensors compare at ISO 400 sensitivity. Finally, the ISO 1600 performance compared. The Galaxy S III isn't present here, as it doesn't have this setting. 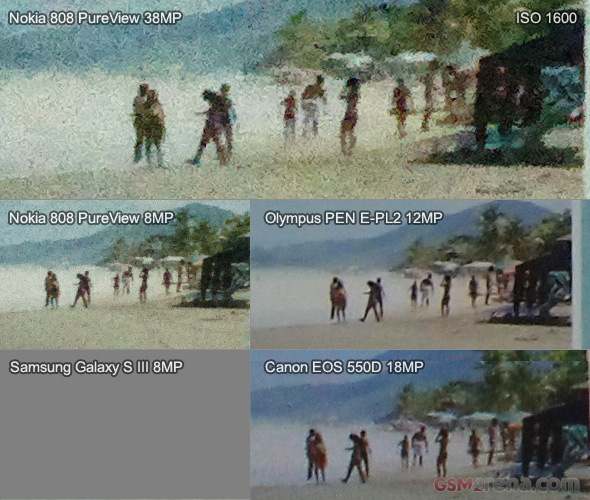 The large sensors are really made to count here as the Olympus E-PL2 and Canon 550D walk away with an easy victory. The Nokia 808 8 megapixel PureView samples hold their ground quite well at ISO 400 and aren't that much worse at ISO 800 either, but can't hold a candle to the DSLR and the EVIL camera at ISO 1600. Back to the more realistic comparison, the Samsung Galaxy S III is only able to match the per-pixel performance of the Nokia 808 PureView, when the latter is shot in its full-resolution 38MP mode. This means that the Nokia cameraphone flagship allows you to either have a much larger image of the same quality or an equally sized photo with far less noise and artifacts. 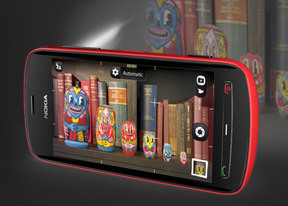 The improvement in terms of both retained detail and noise levels brought by the Nokia 808 PureView compared to its rivals is stunning.